Sometimes I see a piece of clothing, a shoe or a bauble so striking, so covetable that my heart jumps into my throat. Does this happen to everyone or just to fashion whores like me? Well, either way, I got the slightest bit woozy when I saw the latest from Dannijo. The crystal/neon combo isn't particularly new any more (just ask Erickson Beamon or Tom Binns), but it also hasn't jumped the shark quite yet. Instead, the trend inhabits that happy middle ground where retailers and DIYers everywhere make it attainable for plebs like me. Below, I've rounded up some alternatives to that stunning Dannijo... because my wallet hates me enough as it is. There are certainly some viable options there, but by far the best (and cheapest) is a DIY from my friend Najeema of A Stylized Hysteria. Najeema found a cheap rhinestone bib necklace at Forever 21, gussied it up with some nail polish and acrylic paint, and viola! Since I'm a total failure at arts and crafts, she has offered to make me my very own. Hooray! The only problem is that this particular necklace is sold out. Any suggestions? 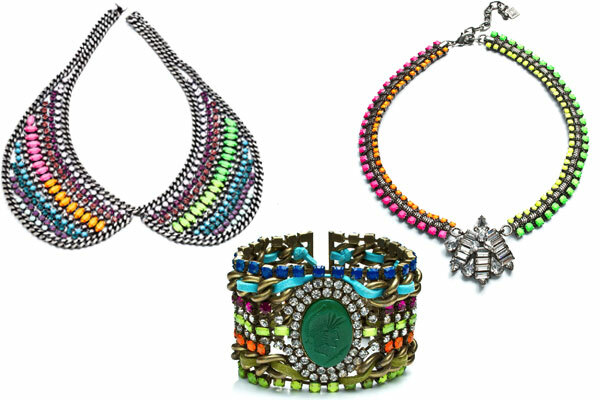 I love the brightly colored baubles! I love those dannijo baubles. They are certainly fabulous! 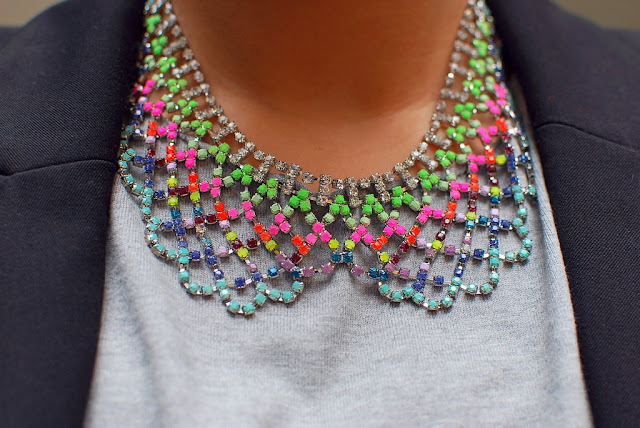 The bauble bar necklace is a great alternative and Najeemas version is perfect! 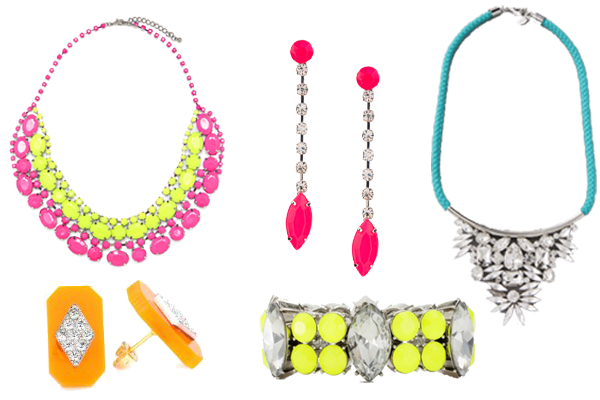 I think Ann Taylor actually has some neon jewelry right now too. they have other necklaces- keep checking dahling! wow- I was expecting these to be waaaay more expensive than that! Fun colors! i love all these neon accents everywhere!!! Love love love bright sparkly baubles-- just wish I were brave enough to wear them with something besides plain tees!